So you want a gold Apple Watch Edition, but you don’t have a spare $12,000 laying around to buy the base model. Well, rather than spend a princely $12,000 on a gold Apple Watch Edition, why not spend $400 on the aluminum Sports model, and invest a couple bucks into some gold spray paint, masking tape, and an xacto knife? 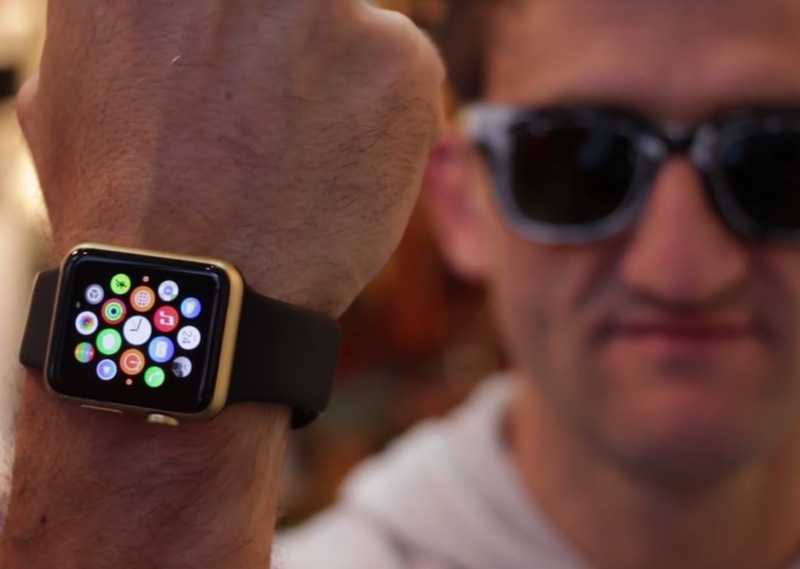 That’s exactly what the always creative Casey Neistat did, who filmed the process of converting a 42mm black Apple Watch Sports model into a gold edition look-alike. Sure it’s a little tawdry if you put much thought into it, but the result is actually kind of impressive to appearances, and it will surely fool many onlookers into thinking you’ve got some big bucks Edition model on your wrist. Sure the gold spray paint will likely chip and scratch off over time, but I suppose as long as you have some metallic gold spray paint laying around you can patch it up as needed, and save your hard earned money. So perhaps if you were weighing buying a used car or a $12,000 Apple Watch in 24 karat gold (or a whopping $17,000 if you get the top of the line model! ), you can just spend a couple dollars at the hardware store instead, maybe donate the rest of that money to charity if is really burning a hole in your pocket to be spent on something. Now, given how well the spray paint works, it’s probably only a matter of time before many users wind up customizing the colors of their Apple Watch to either be gold or many other colors, surely it’ll even be offered as a service by some enterprising companies too. Personally, although I find this very amusing, I’ll be sticking with my space-gray black aluminum model when it arrives sometime in the next decade. Though I’ll almost certainly pick up a third party band for it once there’s a few on the market that are nice. Heads up to CultofMac for the very creative find. Haha that is perfect, I think it looks just as good as the garish real deal, but it’s even better since he didn’t blow 1/5 of the average annual income on some disposable electronics. Casey is the man, love his videos. This is the perfect parody of anyone who is actually foolish enough to spend $15k on a watch, love it. I wear knock-off designer sunglasses for the same reason, it fools everyone and I spent $15. Naw, it looks like gold paint. More interesting would be actual gold leaf. Gee the bad guy will be disappointed after he mugs this dude for a pho $12,000 watch. What’s more douchey, wearing a $17,000 watch or pretending to wear a $17,000 watch? Reminds me of a guy I went to college with in the 80’s. He had a FAKE cell phone in is car to pretend to look rich so he could “impress” the girls. I bought two of the gold watches in case one breaks. Doesn’t everybody? I have to tell you all, being a Billionaire has it’s real drawbacks, and sometimes, (albeit very briefly) I envy the people who have no money. They never have to worry about going out in public and being hounded, asked for pictures and autographs etc. People think because I am rich, I should share. I do but only as long as the little bride doesn’t know. Nice, …if you want people to think that you’re an a-hole. I’d recommend a couple of coats of clear laquer after the gold spray. Lasts longer, less chipping. Gives a nice shine. Technically if you want an Apple Watch and only have $399 you still won’t get it. Doesn’t even look real and if you do something like this to your watch it will be automatically out of warranty so think long and hard before you do. Waste of time in my opinion. I have to admire ones’ audacity to extoll the virtues of unrepentant cheesiness and faux fashion. I liked the unboxing part of the vid. Could also use the UV-cured gel lacquer, found virtually everywhere these days. Much more control over application, plus a protective coating that last 6 weeks on a fingernail. Bonus: the topcoat reflects UV light, so whether it’s the bedroom black light you’ve installed to impress the ladies or entering the drum&base room at your next rave, your custom bling will let them know that you fancy.